The Coolness of Tattoos, without the Regret! More and more people are sporting tattoos. It’s not your grandfather’s saggy battleship anymore. It’s highly fashionable and sought after. Young adults love tattoos! They can feel older and fancier and show off to their friends. Even better, they can experience the tattooing process together and compare each other’s “tatt’s” as they call them. Moms love Laine Too Temporary Body Art because their kids have a blast getting the tattoos, and even though they can last as long as two weeks with proper care, they’re not permanent and can be easily removed when moms want. Who are we kidding!? It’s not just for kids.! Adults love Laine Too Temporary Body Art. They roll up their sleeves and compare corporate logos or novelty tattoos while attending big corporate events. Non-profits hire Laine Too for adding that WOW factor to fundraising events. And brides and debutantes love the special look they get adding a temporary tattoo to accessorize their outfit on that special day. As a corporate events planner, Melaine Rubin knew how to create the WOW factor for any affair. And as a mom, Melaine wanted something unique to offer at her daughter’s Bat Mitzvah Party. She found a temporary tattoo glitter kit that was new in the market, and so each of her daughter’s friends went home looking special. It was a hit! After the party, the phone started ringing with parents wanting to do the same for their children. Melaine was onto something! She spent more than a year researching the entertainment industry and found out all she could about face paint, tattoos and other body art products. The result? Melaine creating her own tattoos and officially opened her business, Laine Too. Her tattoo product is hand blended and set with powder and glitter, which results in her tattoos lasting up to two weeks. This special formula gives Laine Too the longest lasting tattoos in the marketplace. Melaine added Flash Tattoos to her product line for her corporate, fund-raising or social customers. These temporary tattoos, worn by Hollywood stars, appear to look like metallic jewelry. Perfect for serious or not so serious fashionistas, they glimmer and last for a four or five-day period. Now her temporary tattoos are all the rage, but still, not everybody wants a tattoo. Of course, they still want to look special! Always willing to look for more creative ideas, Melaine discovered a method for creative nail art. She has thousands of custom images and logos that are digitally applied graphics. She is the first one in the Chicago area to use this technique. Melaine and her team have been very successful in bringing smiles to kids, brides, debutantes and corporate event planners, but that’s not enough for them! They also want to bring a smile to the faces of the those struggling with a problem or those working hard for a special cause. So each quarter, Laine Too Gives Back! They partner with a non-profit to bring their body art to a special event at no charge to the sponsoring organization. 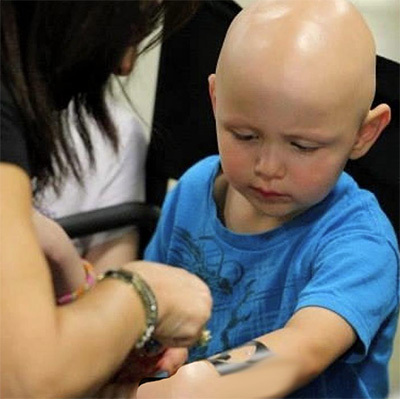 They’ve brought fun in the form of free tattoos to special events put on by folks like the Juvenile Diabetes Foundation, for instance, and many more. The list of previous events is long, and the list of those requesting a partnership is longer, but don’t fear: if you’re a 501-c3 non-profit and they can’t work out a partnership with you, Laine Too still extends a 20% discount. Do you have a special event to promote your important cause? Contact us and tell us about it, and maybe we’ll partner with you! So… what did you have in mind? Whether you are planning a Roaring 20s party or a 90s Hip Hop Event, Melaine has the perfect program for you. Even people who plan a girls night out, grand openings, holiday celebrations, in store promotions, team building programs or PTA events can be entertained with tattoos or nail art. Melaine employs dozens of body artists, all trained by her in the proper application of her tattoo process, who are ready to bring this special attraction to you. All you supply is a little bit of space, and of course, lots of eager guests!